In August 2014 a massive, unbelievably rapid wildfire haunted Sweden. Even with international help it took more than eleven days to get the event under control. A forest area three times the size of Stockholm was wiped out. At its peak the catastrophy destroyed, among other areas, the forest property of Sven Olov Karlsson. He, his wife and children escaped the smoke and flames at the last minute. In this book he analyses how such a fire could come about. Only because a single man ignored dry circumstances? Or because of global warming? The answer is multi-layered. Modern forest exploitation is changing the nature of trees and soil, the irresponsible economic press pushes forest workers to act uncarefully, and then there is of course the management of the fire men – financially pinioned and largely understaffed. 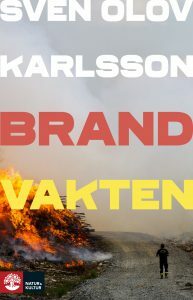 While writing about his very personal experiences, Karlsson created an universal book about many sorts of wildfires, their big and various effects on climate, and our task to combat or prevent them. Investigative journalism, thrilling as an whodunit, on shining prose. One of the most important books of this year.